Follow-up single "Boys and Girls" was released on 5 September 2009, a week before the album's release. The song debuted at number seventy-three on the UK Singles Chart before climbing to number one the following week, earning Lott her second consecutive chart-topper and breaking another record by becoming the biggest leap to the top position in the UK chart history. "Cry Me Out", released as the third single on 30 November 2009, peaked at number twelve on the UK chart, Lott's first single to miss the number-one spot, as well as the top ten. "Gravity" was released as the album's fourth single on 8 March 2010. It charted at number twenty in the UK, making it her fourth consecutive top twenty single. "Turn It Up" was released as the fifth single on 7 June 2010, for which a music video, directed by Nick Frew, was shot in Los Angeles on 17 April 2010. The single became her fifth consecutive top twenty hit when it peaked at number eleven on the UK Singles Chart. "Broken Arrow" was released on 10 October 2010 as the only single (sixth overall) from the Turn It Up Louder reissue. The music video was directed by Gregg Masuak, and premiered on Lott's official YouTube account on 16 September 2010. The single reached number twelve on the UK chart, giving Lott her sixth consecutive top twenty single. Although it was initially suggested that "Coming Home", a collaboration with American R&B singer Jason Derülo, was originally going to serve as the second single from Turn It Up Louder after it debuted at number fifty-one on the UK Singles Chart, Lott later confirmed on her official Twitter page that she was filming a video for "Can't Make This Over". The video premiered on 25 November 2010, but the single release was ultimately cancelled. Digital Spy music editor Nick Levine commented that "Turn It Up is never dull—Lott has too much natural exuberance for that—but it's a little safe and lacking in surprises", citing "Gravity", "Turn It Up" and "Here We Go Again" as highlights. Dan Cairns of The Sunday Times opined that "[b]ar two missteps ('My Love' and 'Nothing Compares'), Turn It Up is superior, infectious, expertly tailored pop that, had it been recorded 30 or so years ago, would very likely now be being praised to the heavens in reissue sections." Dan Gennoe of Yahoo! Music noted that "[t]he sass, swagger, killer hooks and big production have been focused on the obvious chart contenders and the rest of the album is, true to tradition, a lot of middle of the road balladry and overly earnest swaying, also known as filler." Daily Express reviewer Robert Spellman felt that the single "Mama Do (Uh Oh, Uh Oh)" "promised what the album hasn't delivered, a sort sultry self-confidence with a pinch of the wreckless that would do Lady Gaga proud", adding that "corny power ballads such as 'Cry Me Out' and too much half-baked R&B mistakenly attempt to give Pixie depth when she—or rather her writers—should be gunning for surface only." The Daily Telegraph '​s Helen Brown referred to Lott as "[f]un and feisty but hard to distinguish from the rest of this year's girl pop pack." In a review for musicOMH, Michael Cragg dismissed the album as "a fairly average pop album being strangled by a talented vocalist who equates loudness with emotion." Imogen Carter of The Observer compared the album to a "Disney teen-movie soundtrack", calling it "cloying and cliche-ridden, particularly the slow numbers." Turn It Up debuted at number six on the UK Albums Chart, selling 25,652 copies in its first week. Following the album's re-release Turn It Up Louder on 18 October 2010, it rose from number twenty-nine to number nine on 24 October with 15,114 copies sold. On 13 August 2010, the album was certified double platinum by the British Phonographic Industry (BPI), and by August 2014, it had sold 874,038 copies in the UK. Turn It Up became the UK's eighteenth best-selling album of 2010. In Ireland, Turn It Up debuted and peaked at number eighteen on the Irish Albums Chart for the week ending 17 September 2009, The album saw modest success across continental Europe, reaching number sixteen in Denmark, number twenty-four on the European Top 100 Albums chart, number forty-nine in Switzerland, number sixty in France, number seventy in Austria and Belgium's Wallonia, number eighty-one in Germany, number ninety-two in the Netherlands and number ninety-nine in Belgium's Flanders. In Oceania, it peaked at number eight on the Australian Hitseekers Albums Chart and at number thirty in New Zealand. ^ Copsey, Robert (22 September 2010). "Pixie Lott confirms LP re-release". ^ a b "Pixie Lott: Turn It Up Louder". ^ Balls, David (25 January 2010). "'"Pixie Lott 'planning US album release. Digital Spy. Retrieved 9 October 2010. ^ "Interscope Records to Release Debut Single From U.K. Pop Sensation Pixie Lott, 'Boys and Girls,' Digitally on August 24th". ^ "Pixie Lott works record-breaking magic & Kasabian land second number one album". ^ "Week Ending September 19th 2009". Chart Watch. ^ a b c d "Pixie Lott". Official Charts Company. Retrieved 30 March 2013. ^ "Lights, camera, action! Slinky Pixie Lott wows LA as she films new video clip in tiny black dress". ^ Copsey, Robert (5 November 2010). "'"Lott 'hoping to release Derulo collab. Digital Spy. Retrieved 5 November 2010. ^ a b "Turn It Up – Pixie Lott". ^ a b Lester, Paul (2 September 2009). 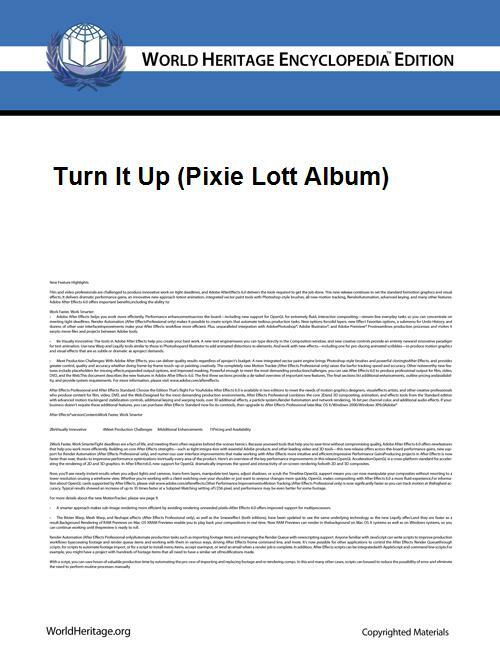 "Review of Pixie Lott – Turn It Up". ^ a b Spellman, Robert (25 September 2009). "Pixie Lott: Turn It Up". ^ a b James, Sarah-Louise (16 September 2009). "Album of the Week – Pixie Lott: Turn It Up". ^ a b Brown, Helen (11 September 2009). "Pixie Lott: Turn it Up, CD review". ^ a b Levine, Nick (14 September 2009). "'"Pixie Lott: 'Turn It Up. Digital Spy. Retrieved 11 October 2009. ^ a b Cragg, Michael. "Pixie Lott – Turn It Up". ^ a b Carter, Imogen (13 September 2009). "Pixie Lott: Turn it up". ^ a b Cairns, Dan (13 September 2009). "Pixie Lott: Turn It Up". ^ "Muse and Cruz top charts". ^ "Kings of Leon and Bruno Mars top charts". Music Week. Intent Media. 25 October 2010. Retrieved 5 February 2014. ^ a b "Top 40 UK Albums of 2010". ^ a b "Top 75 Artist Album, Week Ending 17 September 2009". ^ a b c "Pixie Lott – Turn It Up" (in Dutch). ^ a b "Hits of the World". ^ a b "ARIA Hitseekers – Week Commencing 12th October 2009". ^ "Turn It Up by Pixie Lott". ^ a b "Turn It Up (Deluxe Edition) by Pixie Lott". iTunes Store UK. Apple. Retrieved 22 December 2009. ^ "Turn It Up (Louder) by Pixie Lott". iTunes Store UK. Apple. Retrieved 2 May 2011. ^ Turn It Up (CD liner notes). ^ Turn It Up Louder (CD liner notes). Pixie Lott. Mercury Records. 2010. 2752081. ^ "Pixie Lott, Turn It Up" (in German). charts.de. ^ "Lott, pixie – Turn It Up[enhanced]". ^ "Pixie Lott – Turn It Up (Polska Cena!)" (in Polish). ^ "Turn It Up" (in French). ^ "Pixie Lott | Turn It Up" (in German). Universal Music Germany. Archived from the original on 12 April 2013. Retrieved 6 July 2010. ^ "Turn it up louder – Pixie Lott" (in French).